NBC4 officially launched its annual Fritz’s Holiday Lights and Toys for Tots campaign on November 28, 2012. In its 11th year, Fritz’s Holiday Lights was created to bring holiday cheer to the Southland, with NBC4 weathercaster Fritz Coleman visiting local communities each year in search of the most festive and brightly decorated homes to be featured on the station’s 11 p.m. evening news. For the first time, Coleman will stop in nearby neighborhoods to collect toy donations on a special ‘Fritz’s Holiday Lights’ double-decker bus. The brightly decorated, festive bus will tour local communities each weeknight with Coleman and crew spreading holiday cheer. To follow the bus’ location and find out how you can donate, tune in to the NBC4 News and follow NBCLA on Twitter, using hashtag #FHL2012. The community will also have the opportunity to donate packaged, new toys at participating LA LIVE restaurants through December 14. Fritz’s Holiday Lights and the Toys for Tots campaign kicked-off on Wednesday, November 28 at the ‘L.A. 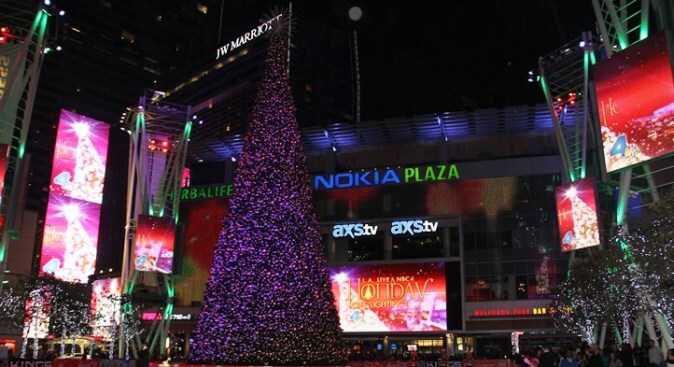 LIVE & NBC4 Holiday Tree Lighting,’ which aired live on NBC4. Coleman co-hosted a special holiday broadcast with Access Hollywood’s Shaun Robinson. The program included musical appearances by Barry Manilow, Ozomatli, Cody Simpson and several other special guests. NBC4 viewers are invited to submit photos of their favorite decorated homes in the region to be considered for Fritz’s Holiday Lights by emailing FHL@nbcla.com with "Fritz's Holiday Lights" in the subject line. On Christmas Day, NBC4 will broadcast a half-hour special highlighting all of the decorated homes featured during Fritz’s Holiday Lights tour.